The all-new Chevrolet SS may be one of most highly anticipated vehicles of 2013, but not everyone is excited about its arrival. While most countries are counting down the days before it hits dealerships, Israel appears to be the lone exception. In fact, a new report by the Hebrew daily newspaper Yedioth Ahronoth via the Times of Israel states that the 2014 Chevrolet SS will not be imported to Israel because the “SS” tag is similar to the abbreviated name for Schutzstaffel, which was a major parliamentary group under Adolf Hitler and the Nazi Party. The Chevrolet SS made its debut this past weekend at the Daytona International Speedway. The SS will be used in the 2013 NASCAR Sprint Cup Series and is set to replace the Car of Tomorrow on the NASCAR circuit. Chevrolet joins Toyota and Ford, who have already unveiled their production-based 2013 Cup entries. The rear-wheel drive SS touts a 6.2-liter V-8 engine and 415 horsepower. Additionally, the sedan goes from zero to 60 mph in under five seconds. Interior-wise, the SS comes loaded with push-button start, touch screen, automatic parallel parking-assist sensors, lane departure warning, blind-spot detector with backup camera, and front collision alert. The vehicle’s fuel economy has not been tested, but it should get similar mileage to the Chevrolet Corvette, which boasts about 26 mpg highway. 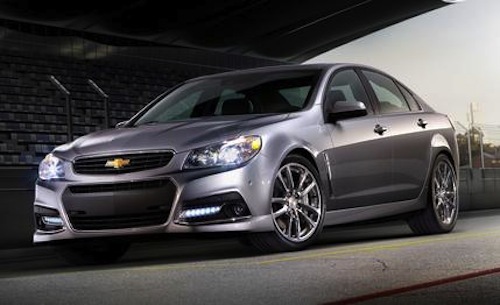 Based on the Pontiac G8, the 2014 Chevrolet SS is a forthcoming full-size sedan in the Chevrolet lineup. The SS is set to hit showrooms in the fourth quarter of 2013. Pricing will be announced closer to the release date, according to GM. The SS will be manufactured by GM’s Australian subsidiary Holden. Introduced in 1961, GM’s Super Sport performance package was first made available for the Chevrolet Impala. The original Super Sport package included “SS” trim for both the interior and exterior, reinforced chassis, stronger shocks, power brakes, spinner wheel covers and whitewall tires. The package was offered for just $53.80. Numerous Chevrolet models have featured the SS badge including the Camaro, Nova, Monte Carlo, and El Camino. Although numerous General Motors cars have featured the SS suffix, the upcoming Chevrolet SS is the first to use the initials as its lone name. And for the same reason, it won't sell well in Germany, I bet.